Haitao Yin was born in 1974 in Harbin, China. From 1992 to 1996, he was trained at Central Academy of Arts & Design (Academy of Arts & Design, Tsinghua University) in Beijing. In 2000, he immigrated to Canada and continues to pursue his interest in arts. In 2008, he became a member of the Federation of Canadian Artists. 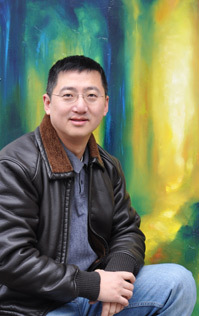 He's also a member of The Chinese Canadian Artists Federation in Vancouver. His paintings convey his love of natural scenery and the pursuit of a peaceful state of mind. His painting style contains the Western landscape painting on the natural color of the advocate and Eastern traditional culture on the lens of Zen Buddhism. Natural inspiration, state of mind, and artistic conception are the three key elements of his paintings. Currently, he and his family reside in Richmond, BC.